A better cleaning solution for a better world. JAWS® – the Just Add Water™ System – is an innovative concept in household cleaners created with the planet and all its inhabitants in mind. Each JAWS cleaner is streak-free, versatile, and eco-friendly, making it a perfect cleaning solution for you and your home. You can refill and reuse JAWS spray bottles instead of purchasing a new bottle every time! That reduces the amount of plastic in landfills, which is great news for the earth. 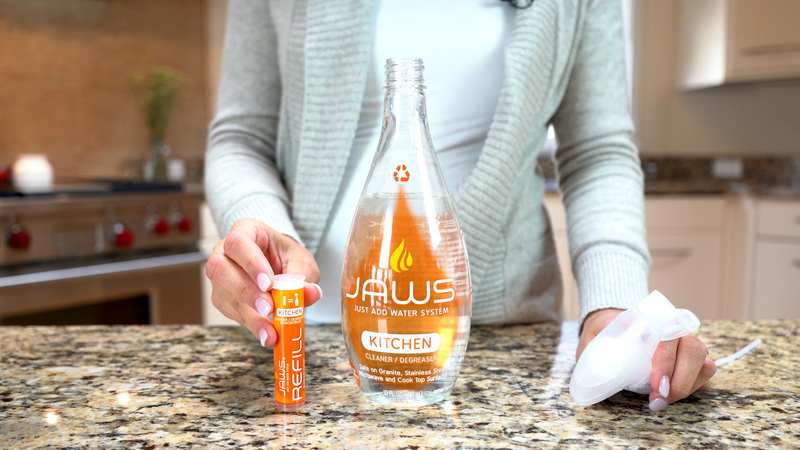 Meet JAWS eco-friendly cleaning products. We’ve got concentrated, streak-free, eco-friendly cleaning products for every job, every room, every nook and cranny in your house. With JAWS non-toxic* cleaning products, you can eliminate grime and care for the earth. Our reusable, refillable, JAWS bottles come with concentrated refill pods to make eco-friendly cleaning products that are effective, yet biodegradable, and clean without streaking or leaving a residue. When your first spray bottle is empty, simply refill it with water, reload, and reuse! Get your bathroom clean and keep it clean. Our daily shower cleaner achieves both goals on your behalf. It works quickly to dissolve and emulsify soap scum, water spots, and mineral deposits leaving nothing but a streak-free shine in its wake. Each JAWS refill pod contains super-concentrated cleaning solution that has the power to remove dirt without leaving residue, streaks or haze. When your first spray bottle is empty, you simply refill with water, reload a new pod and reuse. JAWS refill pods are also recyclable. JAWS products leave your home spotless and safe for everyone, including children and pets. They’re biodegradable, too. * All JAWS products except the Disinfectant Cleaner are non-toxic. There’s no pouring, no spilling, and no measuring like conventional refill bottles. And our refill pods are so small you can always find room to store them.